Net Weight: Packet (225 seeds)1/4oz (4375 seeds)(+$7)1oz (17500 seeds)(+$27)1/4lb (70000 seeds)(+$94) This item is currently out of stock! 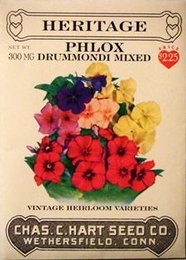 The word Phlox is from the Greek word for flame since most of the color variations are of the richest reds. In Victorian England, young ladies looked to see if Phlox was in the bouquets they received from an admirer since the flowers meaning is a proposal of love and a wish for sweet dreams. One of the easiest annuals to grow they flower freely during the entire summer bearing very fragrant blooms on strong stems. Prefers rich soil and full sun. Height 1 foot. Sow outdoors as soon as the ground can be worked or start indoors 6-8 weeks earlier. Cover seed 1/8 inch deep with fine soil. Keep soil moist until seeds sprout. May be planted as late as mid-June.